I create landscape paintings and live at Far Fields Farm in Washington, Connecticut — in a home that has been in the family for four generations. I am privileged to have a beautiful and inspiring setting in which to paint and raise my three little boys. Life is wonderful; and almost always messy. Alongside the chaos, I try to be a little bit creative and grow every day. 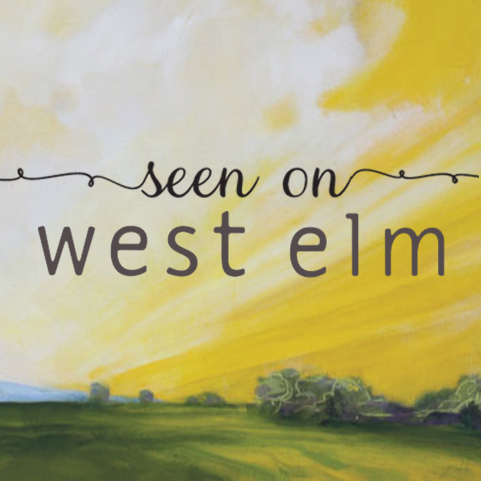 My print Western Dawn has just launched on West Elm! I am so honored to be featured in Domino Magazine's monthly series, At Home with a Minted Artist! The previous featured artists are all amazing and I feel very lucky to be counted among them! I'm hoping this begins a next chapter for me and opens some doors! Below are some of the photos from my home and studio that were not in the story.